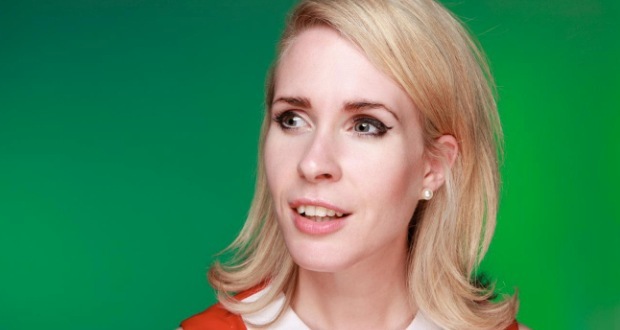 Lucy Beaumont’s on stage persona is a perfectly studied parody of a slightly airheaded Hull woman. At least, we assume it’s a parody. If she’s really as airheaded and easily confused as her persona suggests it would fairly hard to get to this stage…or any stage, for that matter. The petite, blonde comedian cuts quite a striking figure on stage in a nylon-Capri-pants-and-leopard-print-ballet-pumps combo that match her market stall persona perfectly. She looks like a car boot sale Disney princess, and her delightful stories about various trials and tribulations she’s had to face recently – including a hen weekend in Blackpool (something that no one would wish on their worst enemy) – are enhanced by her sweetly naïve delivery and sudden, unexpected changes of subject. This combination gives the whole show a slightly surreal air, added to by the working men’s club sign on the wall. Beaumont is the latest in a long line of comics that channel the spirit of smoky, Northern 1970s comedy clubs – so much so that you half expect she’s about to make a mother-in-law joke. She might not look like Les Dawson, but there’s some subtle essence of him at play here. Another comic who’s clearly had an influence on Beaumont is Victoria Wood. She repeatedly refers to her unseen, hulking best friend in much the same way as Wood would evoke her friend ‘Cynthia’ in her sketch about two school girls (“I’m looking for my friend. Have you seen her? She’s very very tall and very, very wide.”). She also spends some time auditioning for a boyfriend for her pal. Male audience members, you have been warned. Beaumont also gets a lot of comedy mileage out of her home town, with Hull featuring heavily in her various – very funny – anecdotes. She spends quite some time analysing various fast food flyers, something that really shouldn’t be that entertaining, but thanks to her clever pauses and knack for seizing on small details she manages to reduce the room to tears of laughter. Other highlights include the aforementioned account of a hen weekend in Blackpool, not to mention the way she constantly changes tack and lobs artless non-sequiturs at the audience in a way that seems designed to keep everyone on their toes. It’s a real shame that we haven’t heard more from Beaumont in the three years since she last appeared at the Fringe. As the dizzy, hilarious spiritual successor to Victoria Wood, she really deserves her own sitcom…or at the very least the lead role in a reboot of Dinnerladies. Definitely one to watch.